The One For My Birthday! Good morning polished world! How are you doing today?? I am fabulous because today is my birthday!!!!!!! If you follow me on Instagram, you know that my co-workers have been doing a daily scavenger hunt for me which has been so fun. Kind of nervous to see what today's gift is going to be. 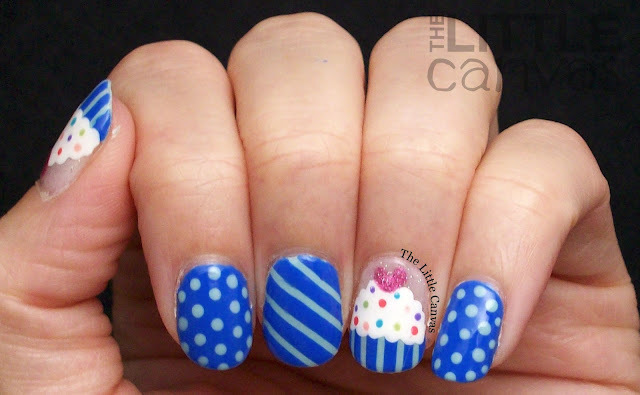 As you may know, each year I do a cupcake manicure for my birthday. I have to say I think this year's is my all time favorite. 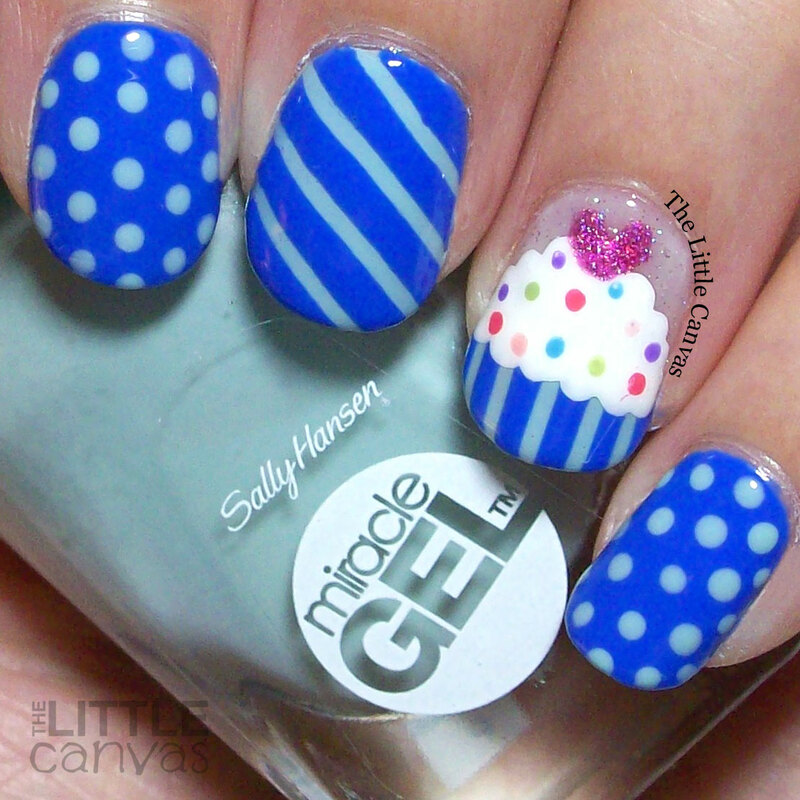 This year I was inspired by this cupcake mani by Sensationails4U! I absolutely loved her version. I was going to do them in pink, but then I debated on switching it up and doing them either in blue or purple. After polling a few of my friends, blue won. Good thing it did too, because the dress I'm wearing today is blue and matches this manicure pretty well. Oh my goodness, how cute are these? I'm so happy I went with the blue design!!! 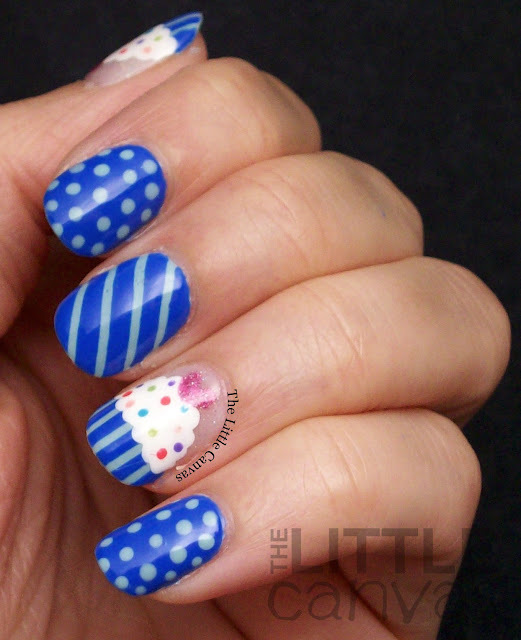 I also think that after almost five years of blogging, I finally figured out how to properly use nail art tape. You know, so the base doesn't peel off, and it doesn't bleed underneath the tape. 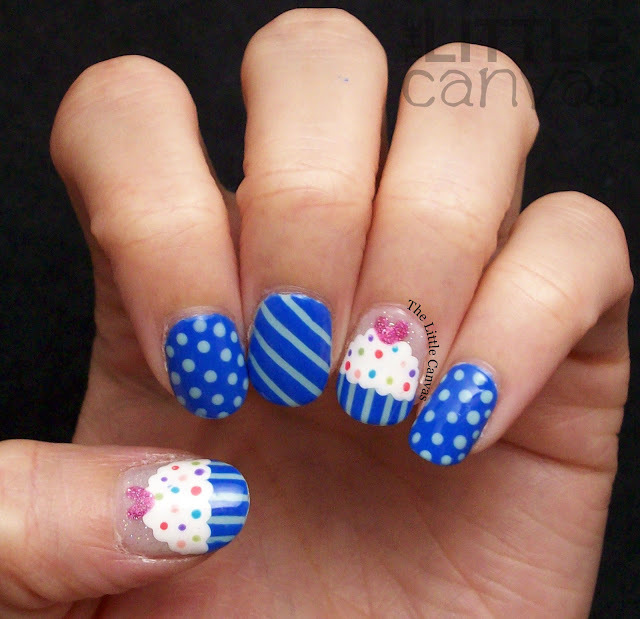 After seeing how good the tape was on my middle finger I decided to use the tape on the cupcake. So happy that I did because that helped make my cupcake perfect. 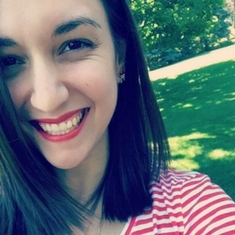 Seriously, look how perfect those lines are. In previous years I've used my nail art brushes or stripers to get the lines and they always end up looking wonky. Nothing is straight or evenly spaced. It just looks messy and it makes me hate the design. This is perfect in every single way. Byte Blue is gorgeous. While it looks just as bright as Sally Hansen Pacific Blue, it is a bit more muted in person. Two coats and full coverage. It was perfect for tape art because really I only needed one coat to cover over the top of B Girl. What do you think? Fan of this look? Think it's perfect for my birthday?? I noticed the other day when looking for polish at the drug store, B Girl has been re-released, and Byte Blue was also floating around. So both of these colors are available now if you want to get your hands on them! I highly suggest it! 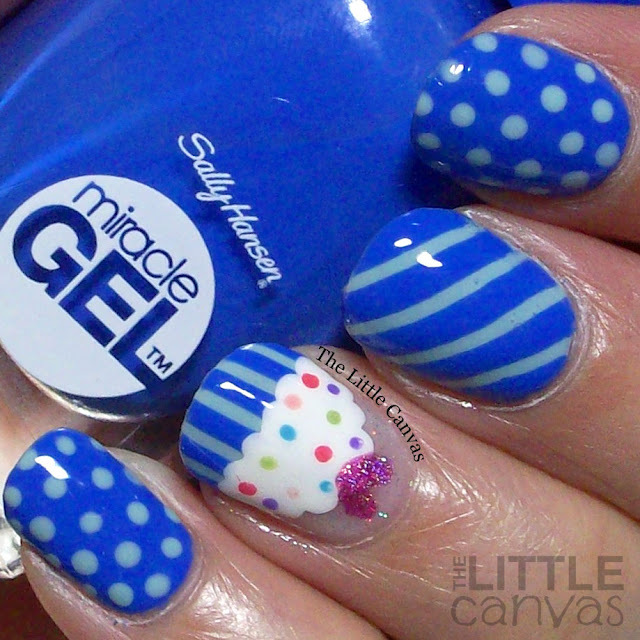 I really love my Miracle Gel polishes, they apply evenly and they last longer on me than typical polishes. Well, I am off to see my birthday work surprise!!! Until next time, <3.